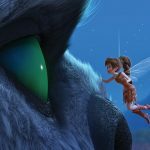 The newest Tinkerbell movie, The Secret of the Wings is set in Neverland where the Never Fairies do what fairies do—change the seasons, help animals and paint flowers. 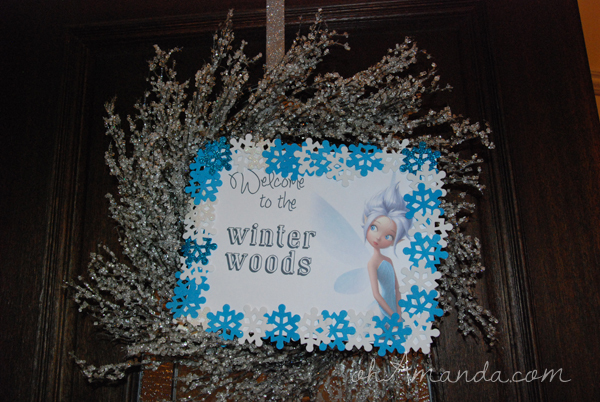 There’s only one part of Neverland they never visit (until now, that is): the Winter Woods! 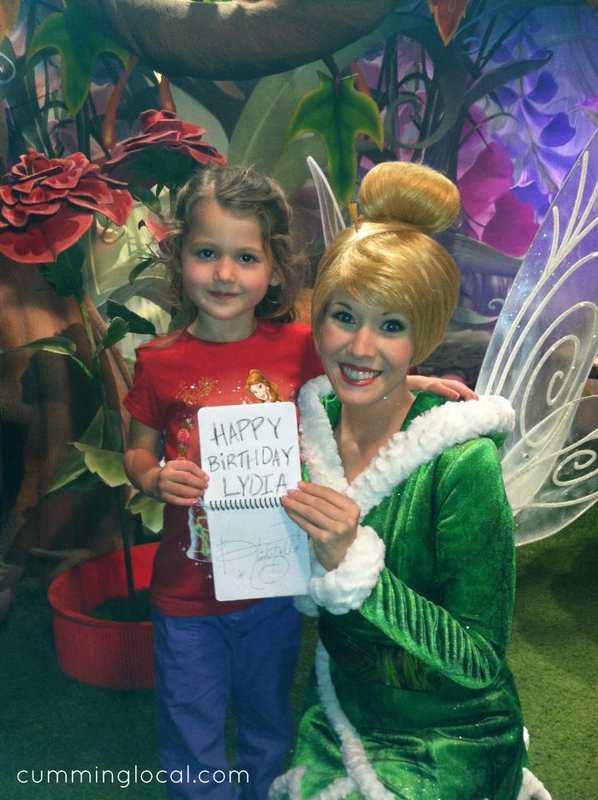 This was the setting for Lydia’s 7th birthday party! 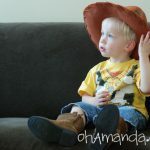 We totally loved the movie and a winter party for January is a shoe-in. 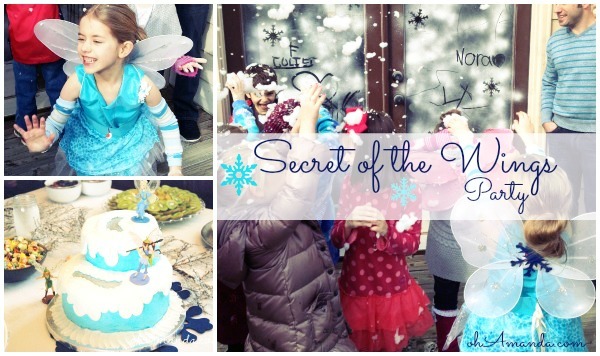 And as usual, the party turned out even more fun than I hoped–even with 20 kids there! 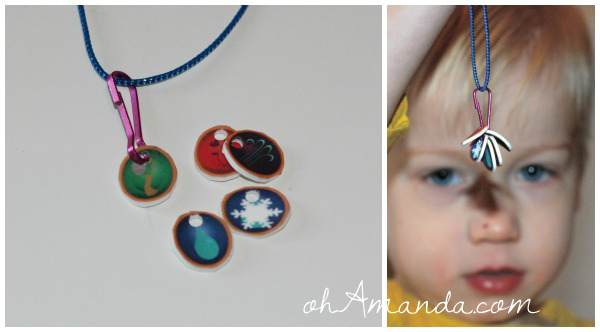 I made these necklaces out of my favorite medium: SHRINKY DINKS! The Disney Fairies website had some printable shrinky charms, so I printed out (and cut, that was the worst part) enough for every kid to be in a talent. 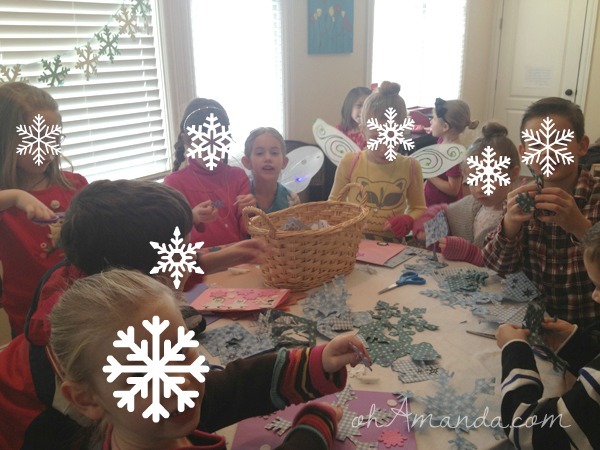 Once they picked their talent, they were ushered by the beautiful Frost Fairy, Lydia to our craft table. 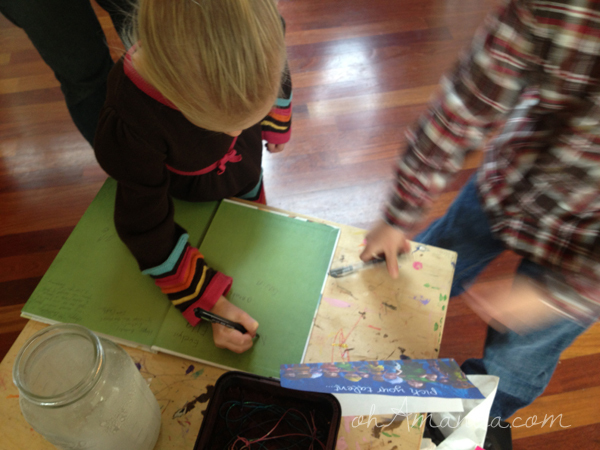 There were two simple crafts to choose from. The first was paper snowflakes. 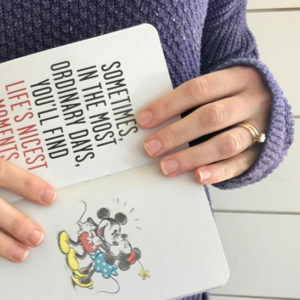 I have this super cool book with snowflake templates (found it at a toy store for 50% off after Christmas! Woot!) and was amazed at how much the kids enjoyed this! 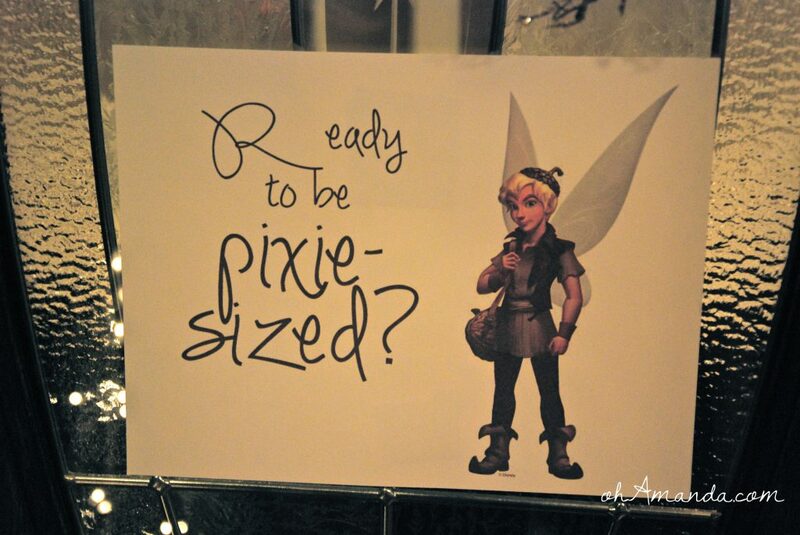 Finally, it was time to begin the Pixie Hollow Games! 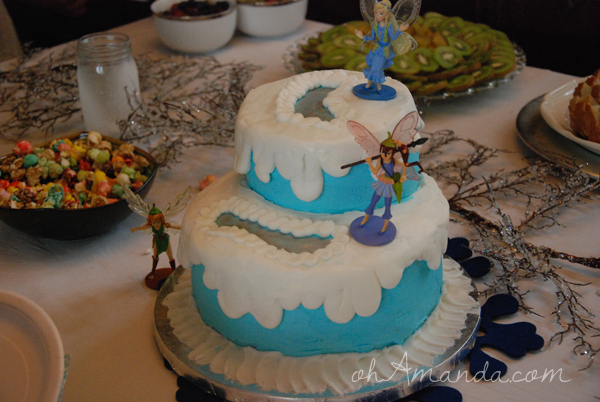 The kids…er, fairies were divided into their talents and then told that even though they may not have noticed, when they entered our house, they were shrunk down to the size of a fairy–only 5 inches tall! 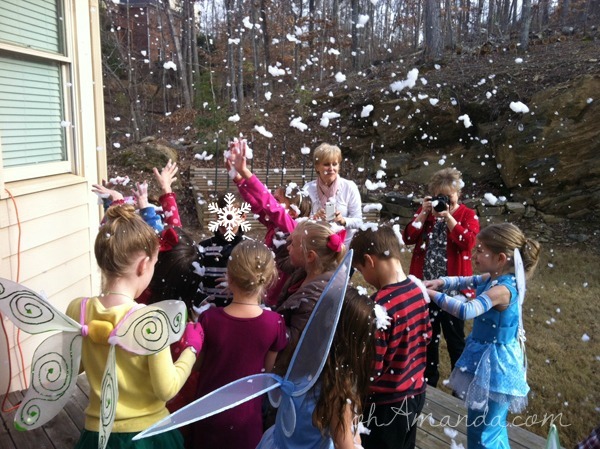 Each talent group was then ushered to a fairy game—a huge fairy game that really would make them feel 5 inches tall! My husband ran the giant Snowflake Puzzle. Which was basically a huge piece of board cut into a puzzle shape. I painted it white and then free-handed some snowflakes on it. They weren’t lovely, but I think it turned out ok! I was in charge of the Pixie Pick Up Sticks. One inch PVC pipe was wrapped at each end and in the middle with colored electrical tape. 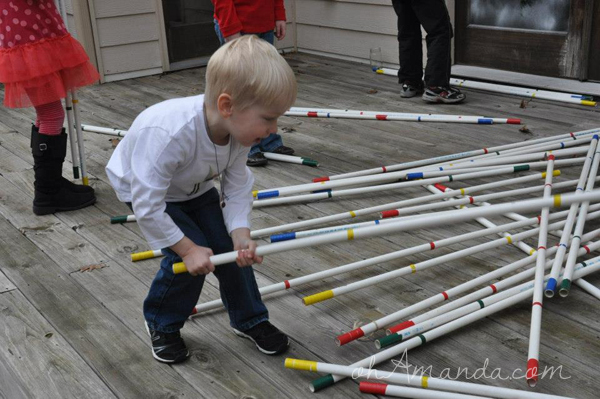 Then we dropped them all on the porch and played Pick Up Sticks! It was waaay harder than it looks and I may have let a few wiggly sticks slide. Tinkerbell loves to find Lost Things. So, my mom led the kids in playing a matching game with some of Tink’s Lost Things. I found twelve matching baskets at the dollar store and Lydia collected 6 paired items (gloves, snowflake ornament, shoes, jacks, etc.) 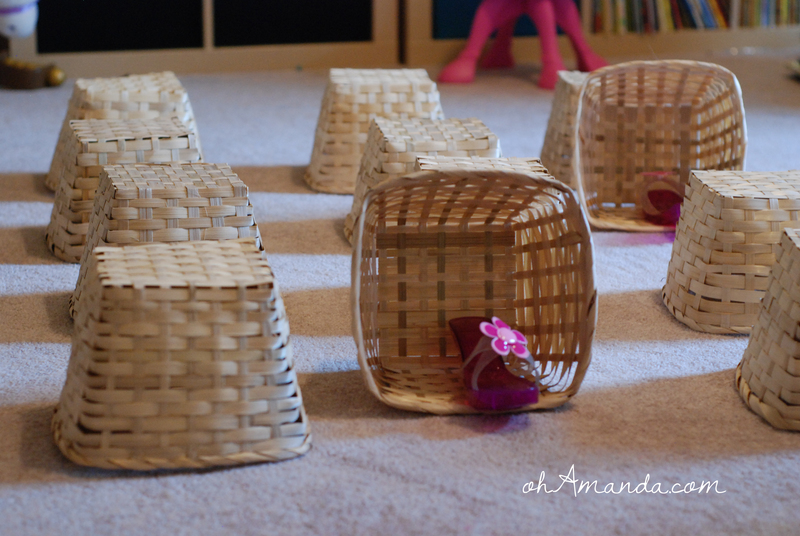 We put an item under each basket and let the kids play memory. The last and most giant game was Twister, with my BFF Staci calling the shots. It was really just a huge drop cloth (or maybe it was a giant sheet?) with spray painted dots on it. 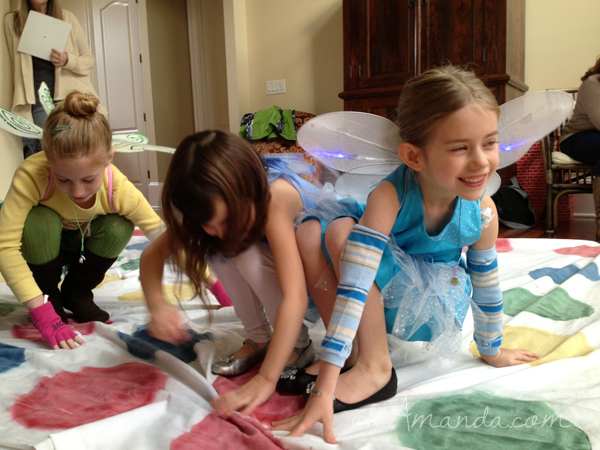 We played Twister like normal–just on a huge playing mat. After five minutes (which I counted down on my iPhone), I called for the talent groups to rotate to a new station and new game. When they left each station, they received another Fairy Talent charm to add to their necklace. Finally, the Pixie Hollow Games were over (and everyone won!) and it was time for the main event: the Snowfall! My mom has a snow machine which we rigged onto our roof. We had the kids crowd around Lydia, sing Happy Birthday and when it was over my husband flipped the switch to make the snow fall! The kids LOVED it. 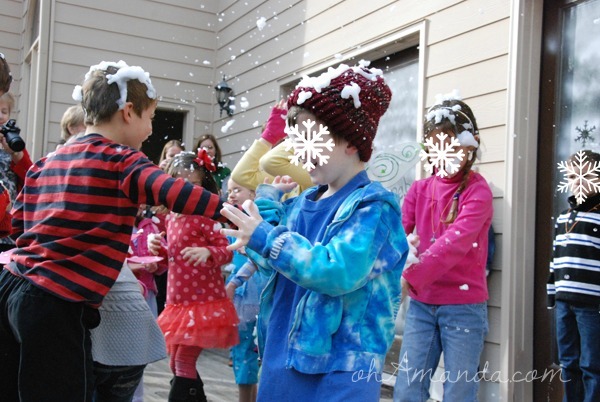 Of course, it was just then that I remembered the snow was made out of bubbles and if the kids got covered in it, they’d be soaking wet. So, I had to run upstairs and dig out any clean towels we had. Since there were 20 kids there and I only found 3 clean towels, I’m sure some kids went home smelling soapy. Staci, my cake baking hero and long-time BFF, made the cake. Lydia said she wanted it to look like an ice skating pond. 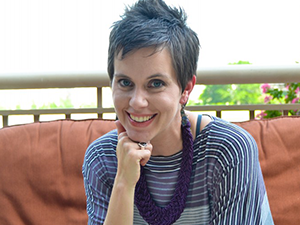 And whadya know, Staci made it happen. As usual. We also had starfruit and kiwi, because I think those seem like fairy food. I also did frozen grapes and blueberries because that seems like frost fairy food. The final and most exciting snack was to be snow cones. I was going to make some homemade syrup which quickly got ditched after the kids tasted my first batch. Then, we decided to use plain old juice. My husband bought blueberry (because that’s what I requested) and it was revolting. So, my last resort was Grape Kool-Aid. 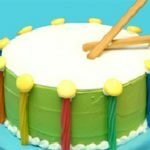 I am very anti-food-coloring and didn’t want to use this, but we were getting down to the wire here! I whipped up the Kool-Aid and put it in this cute container with a spout that I bought at Michael’s for like $2 on clearance. The next time we opened the fridge it had leaked out completely! Every single drawer and shelf in my fridge was covered with grape kool-aid. There was nothing I could do before the party, so it just sat there. Then afterwards my husband and I cleaned the entire fridge and threw away half our our newly purpled food. Fun times. Just what you want to do after hosting a party. We’ve been collecting these fairy ornaments since Lydia’s 1 year old Purple Fairy party. 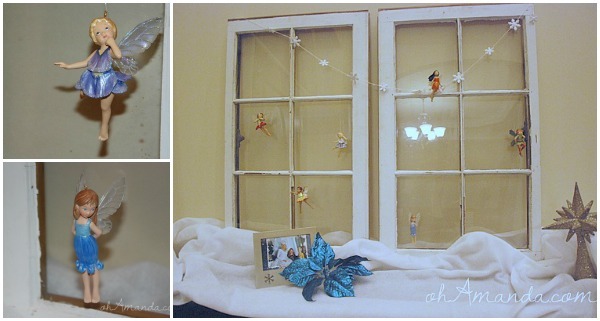 It was sweet to have them all hanging up by the guest book table in our entryway. Oh, and I did snag some snow-in-a-can at Wal-Mart for 37 cents. So, we frosted our big glass doors with that. 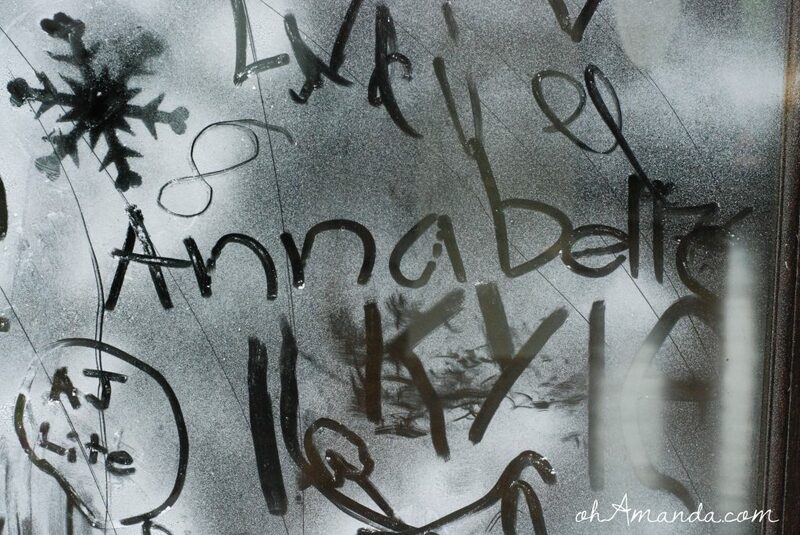 And then let the kids write their names in it. Which was pretty cool. And I guess that’s it. Oh, wait! Except one thing. Did I mention my sweet Frost Fairy, Lydia? 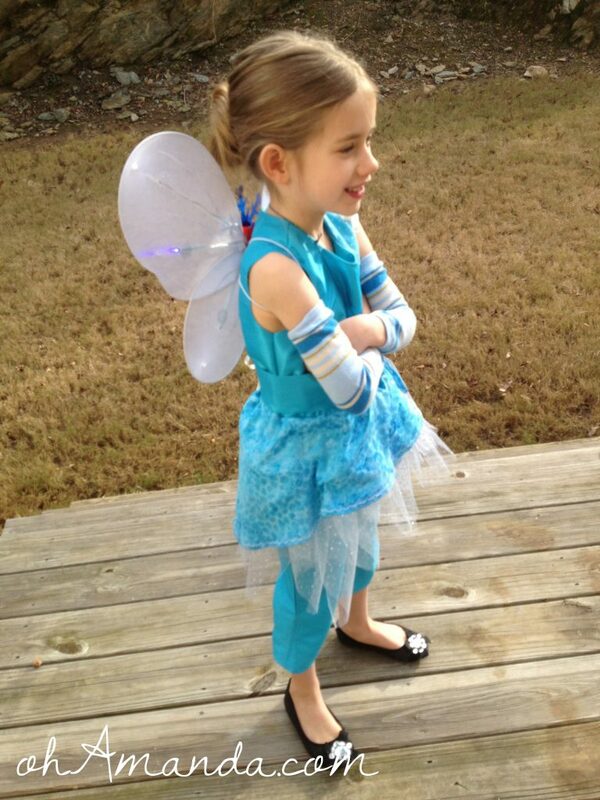 My mom made her a Periwinkle costume (Periwinkle, she’s the main frost fairy in the Secret of the Wings movie). Doesn’t she look beautiful? My mom did a great job on the costume, too. She didn’t have a Peri pattern to follow, so she just made it up from another fairy costume. 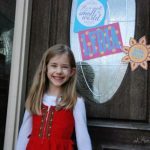 Lydia was the perfect hostess, greeting people at the door, showing them the crafts and food, exclaiming with joy over each gift and then giving her own gift to each friend as they left (Tinkerbell & Periwinkle lipgloss watches from Wal-Mart’s clearance Christmas section: 25 cents each! 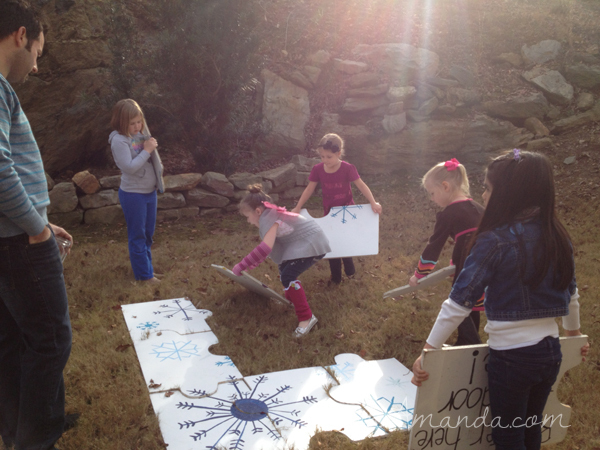 for the girls and a homemade snowflake crayon for the boys). So, what do you think? Are you ready to enter the Winter Woods with us?